You don't have the time to perform a proper clean of your windows? You can solve this issue with our efficient window cleaning services in Southwark! Receive all the important help from Top Window Cleaners. Enjoy the good look of your windows without dealing with stains, water marks, and build-ups. Save hours of hard work with our services. Contact us over our 24/7 hotlines or via our online facilities. Book now, and enjoy attractive service benefits at competitive rates. 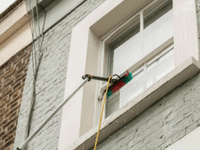 Why Hire the Window Cleaners in Southwark? We deliver professional window cleaning in Southwark with the most modern methods, such as the water-fed pole system. It is an environmentally-friendly technique which guarantees amazing results without the use of detergents. The only cleaning agent used is purified water – it is a de-mineralised water which reacts with the grime on your windows and absorbs the dirt. As a result, all stains, marks and build-ups on your glass surfaces will be gone. The extensions of those water-fed poles allow us to reach up to the fourth floor. For mid and high-rise structures, we use a rope access system. For the inside work, we use ladders and squeegees. Have your residential windows cleaned by experienced specialists. Preserve a healthy workplace with our office glass cleaning. Don't neglect the conservatory, get a proper cleaning care with us. Book our efficient window cleaning in Southwark today – give us a call on 020 3404 9775! Our customer representatives are always ready to help you. Get in touch today, and ask them for a free price estimate. Our support centre is active 24 hours a day, seven days a week. You will get answers to all the inquiries you have regarding our window cleaning. Alternatively, you can reach us out online. Fill in our request-a-service form and will call you back immediately. We also maintain a website chat facility, where you can join an instant live session with one of our helpful advisers.